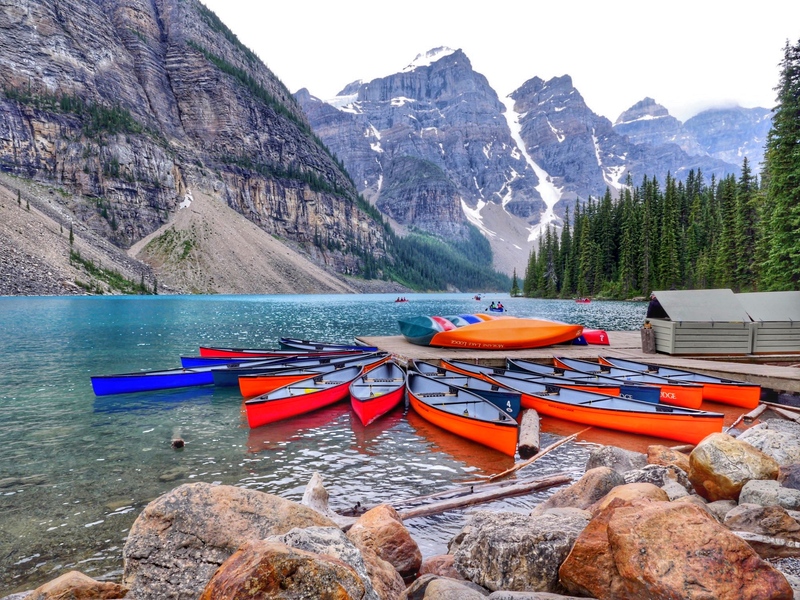 In one of Canada’s most picturesque locations, 2 hours north of Vancouver, lies the town of Whistler, British Columbia. Best known for its skiing, Whistler actually is a great place to visit year round. Here is my Whistler BC travel guide for all you need to know to plan the perfect luxury girls’ getaway to Whistler, BC. Nothing quite says luxury girls’ getaway like the Four Seasons. 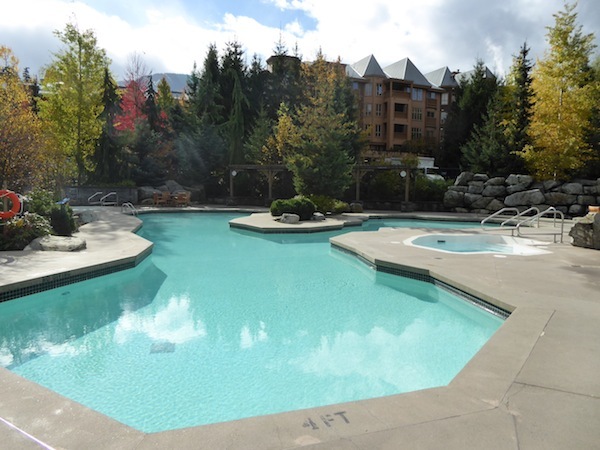 The Four Seasons Whistler located at the foot of Blackcomb Mountain is the perfect luxury accommodation in Whistler BC. From an on-site spa, heated pools and year-round hot tubs to great restaurants and shopping, the Four Seasons Whistler does not disappoint. The rooms are large and have beautiful views of the mountain landscape. 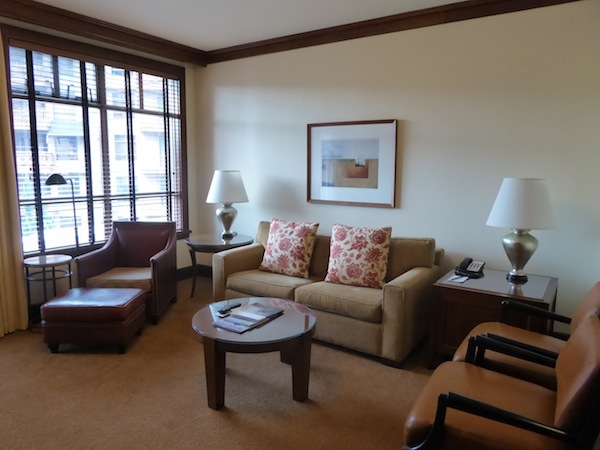 The bathrooms are extremely nice and you’ll want to stay in and take a bath and then sit down in front of one of the hotel’s amazing fireplaces. Like any perfect ski lodge, there are enough amenities on-site year round that you don’t need to leave the Four Seasons if you don’t want to. With a great restaurant like Sidecut and free wine and cheese tastings for guests in Fifty Two 80 Eatery + Bar, you probably won’t want to anyways. An added bonus in winter is that the Four Season offers a free ski concierge all winter long for guest of the hotel. Once you check-in, your skis are taken care of by the hotel and driven to the base of the mountain each day. Transportation is also provided for skiers to get to the various mountains. Skis are kept safe by the hotel at night. 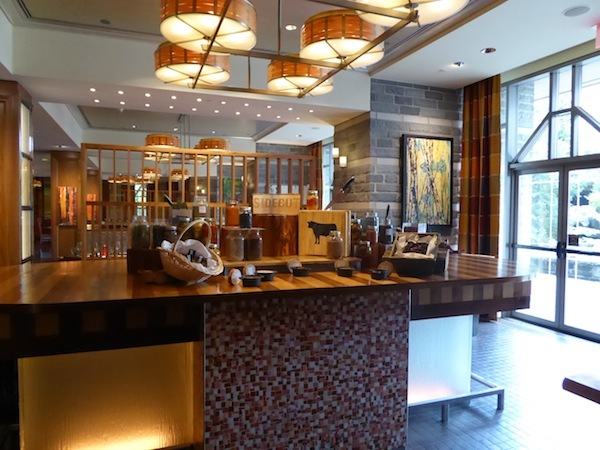 Whether with your gal pals or your family, this service is enticement enough to head to the Four Seasons Whistler for luxury accommodation in Whistler BC. It is not a luxury girls’ getaway without great food and cocktails. I was shocked by the abundance of incredible restaurants in Whistler. Here are my favourites for brunch, lunch and dinner. From eggs benedict and specialty hash to a full lunch and drink menu, La Bocca is the perfect place to grab brunch. 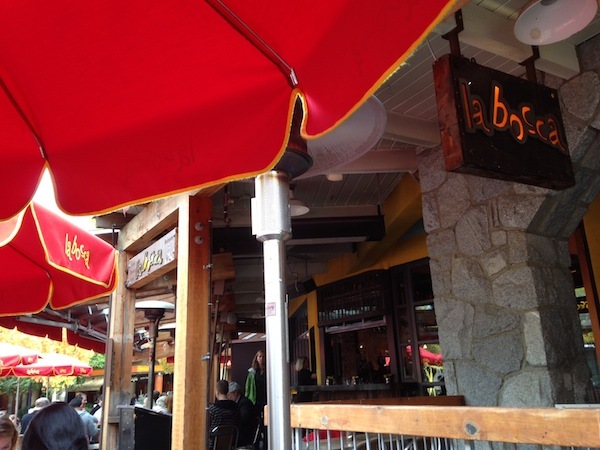 Located right in Whistler village, the patio is the best seat for people and more specifically dog watching. You can sip on cocktails or “sparkling winetails” while you plan out the rest of your day in Whistler. The staff here is welcoming and fun while the food is delicious. Once you add in your girlfriends, you have the perfect recipe for a great brunch. 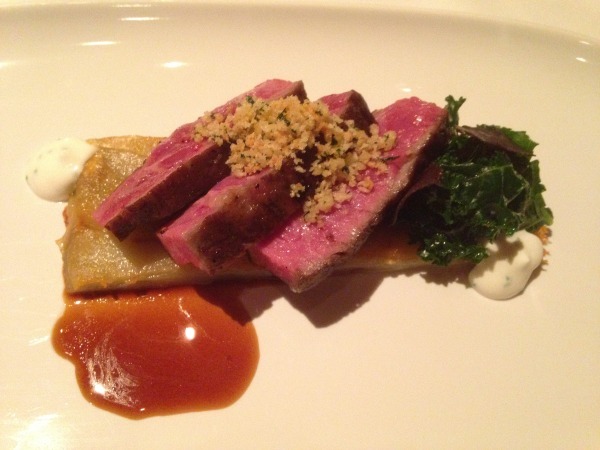 Of all the restaurants we tried in Whistler, I was most impressed by Bearfoot Bistro. 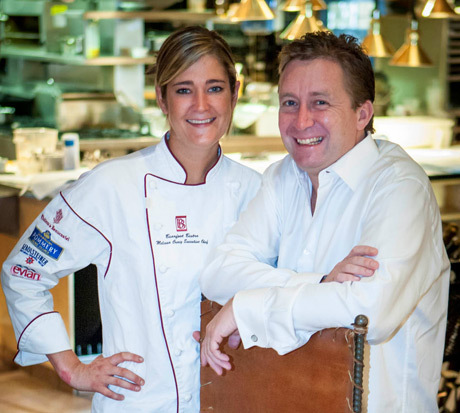 The restaurant, adjacent to the Listel Hotel, is an experience in itself. Try not to feel too overwhelmed by the wine list, the on-site sommeliers and founder André Saint-Jacques will steer you in the right direction. 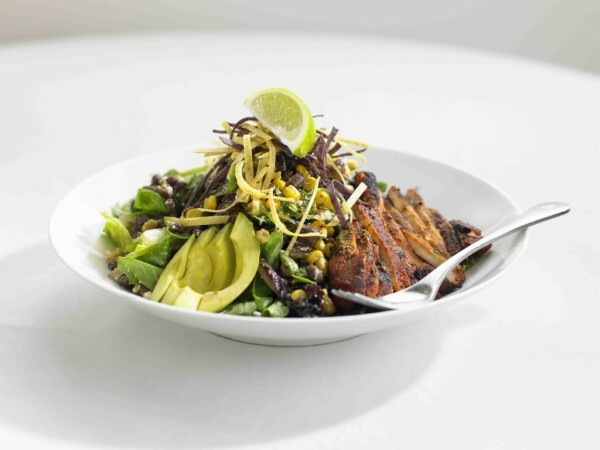 We tried the new Fall menu on the day it was released and it was like the kitchen had been making it for years. My favourite offering was the onion soup which is served is a very non-traditional way. I was also highly impressed by the angus beef flat iron and potato pavé. The only slight criticism of the entire menu we girls could find was that the truffle risotto was overly truffely and that’s coming from two girls who don’t particularly enjoy truffles. We still pretty much licked the risotto plates clean while we hoped no one was looking. There are two do not miss experiences at the Bearfoot Bistro. The first is the nitro ice cream sundaes made table side for dessert. Part science experiment part magic show, the making of the ice cream is an event in itself. We couldn’t believe the texture and flavour of the tahitian vanilla ice cream and once again licked our bowls clean. There are a fun assortment of sundae toppings that come along with the ice cream. The second not-to-be-missed experience is the Belvedere Ice Room. 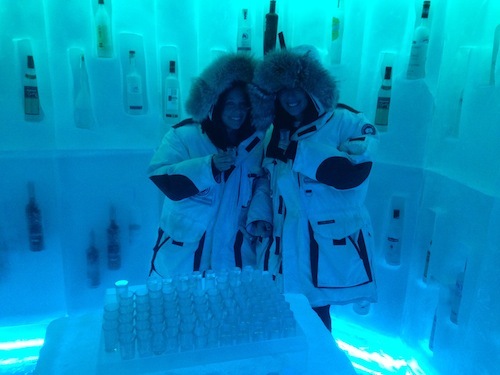 Literally made out of ice, this vodka tasting room is a small intimate space for trying more than 50 vodkas from across the globe. The Bearfoot Bistro provides you with Canada Goose jackets to keep you warm during the experience. One word of warning, don’t lick the ice on the wall even if you think its funny or you’ve had a few glasses of wine. My tongue hurt for days after doing so. The hotel pool and spas at the Four Seasons Whistler. With all this eating, you are going to need to relax in style during your luxury girls getaway to Whistler. In a 48 hour period, I was able to try two very different spas. The first was the spa located at the Four Seasons. As you may know, I love the spa at the Four Seasons Toronto. When anything goes wrong in my life, my first instinct is to rush to Yorkville and lock myself in the Eucalyptus steam room. Be warned the spa at the Four Seasons Whistler has nothing on the the Four Season Toronto. That being said, it is a nice spa with a small steam room, nordic shower and shared hotel pool space. I was a little shocked by how crowded the spa was before and after my treatment. It was standing room only in the relaxation / waiting space. I missed the dedicated relaxation spaces I was used to in Toronto but must say my massage was incredible and very fairly priced. 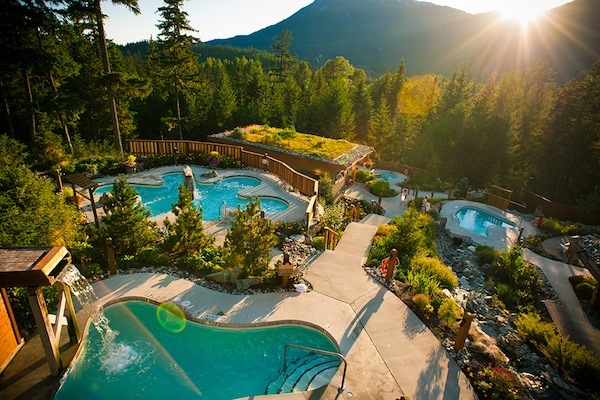 For a full day spa experience, the only place you need to even look into is the Scandinave Spa. You and your girlfriends can literally spend an entire day on site. The spa is based on the Scandinavian ritual of hot, cold, relax. You are invited to immerse yourself in hot pools or hang out in gorgeous steam rooms and then cool your body under Nordic mountain rain showers or cold waterfalls. After that its time to relax in the dedicated napping spaces, gorgeous outdoor seating areas with mountain views or by a warm fireplace. 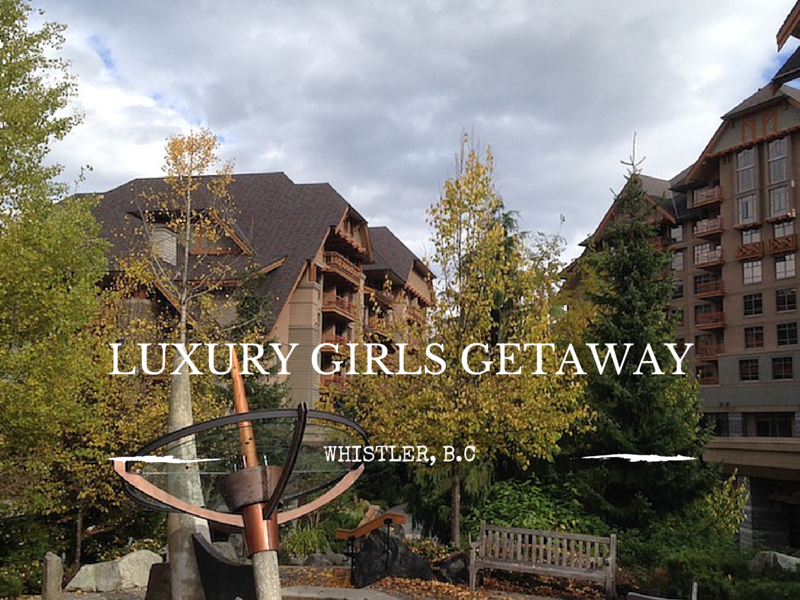 Ready to take a luxury girls’ getaway to Whistler, BC? Bookmark this Whistler BC Travel Guide and get planning! Wonderful place. I had heard of Whistler being a wonderful nature destination, but as I see now it’s worth a trip just for the wonderful hotels and restaurants. The Four Seasons looks amazing – and the Spa is just out of this world. I really would like to visit one day, if not I’ll keep Four Season in mind for a relaxing weekend away, perhaps in a European destination.